The Castle Hill of 232 metres and the Sipos Hegy of 107 metres rise above the plain, boggy meadows of Nagyberek. The location of the village provides a wonderful panorama of Fonyód, the south-western basin of Lake Balaton can be seen from Sipos-hill. The hills are of volcanic origin, they had been developed simultaneously to the monadnocks of the Veszprém county shore, a long time before the birth of Balaton. Northern side of Castle Hill lies directly above the lake-shore. The houses of the town of 5,400 inhabitants are built on the hill-sides in semicircular arch. 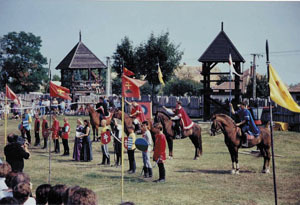 The village was first mentioned in a document of census of King St. László dated 1082. 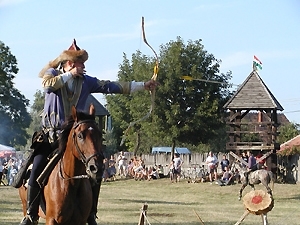 At the time of the wars against the Turkish, the castle situated in the middle of a bog was a famous fortress (led by captain Bálint Palonai Magyar). The castle was taken by the Turkish in 1575 and wiped out completely. The village was also destroyed, it was only a domanial farmstead comprising 17 houses even at the time of the 1848-49 freedom fight, and cottars and fishermen lived there. Fonyód was an island in the old times when the water-level of Balaton was higher, even in the 1920s it was linked to the land by a cart-road. Since the 16th century Fonyódpuszta has had a ship-way with Szigliget, the famous Kisfaludy steamship initiated by István Széchenyi also used the port completed in the 1840s. Regular passenger transport started at the turn of the century. Construction of villas on the domain of Earl Béla Zichy (currently called Bélatelep) divided into allotments commenced in 1895. The new port (and landing place) was completed in 1898; later it was made suitable for landing of bigger ships, too. On the road to Kaposvár the place of a former border castle is signed by a memorial park with a moat, a palisade wall and watch-towers. Press-house restaurant above the border castle is famous for its 22 metre long cellar; it is the only folklore monument of Fonyód. Nice view from the promenade of Béla Bartók street at the foot of Castle Hill to the wonderful monadnocks of Tapolca hollow. Street theatre, performances of brass bands, fairs of arts and crafts and handicrafts on the main square of the city centre of great atmosphere. Exhibitions in the Mini Gallery and Fonyód Villa Gallery. The Crypt-villa is open to the public again, which preserves the memory of true love. A man who was true to his lover till death raised an unusual monument of the girl who died at a young age. He got their wedding bed carved of stone and got their bodies made of marble placed in the stone. One of the most frequently visited and most spectacular programmes of the town is the stall-keepers' fair in Blaha Lujza street on Wednesdays and Saturdays. Besides the traditional bazaar there is flower and vegetable market, second hand and live-stock market. The Fonyód Gastronomic Club has been popular since its foundation, it offers traditional local dishes to the visitors. There is an Association of Hosts, there are programmes for children on the beach near the railway station. A 1,5 km long promenade from the railway station to Postás look-out tower of Sipos-hill, and a 4 km long promenade to Berzsenyi look-out tower of Várhegy. Largest round view of Balaton highlands from the Berzsenyi look-out tower. Fő street runs southwards out from the town as a path, taking the path we can get to Nagyberek and Csisztapuszta, the famous medicinal bath with a 5-km walk. The village of Buzsák famous for its great folk art is another 4 km from there. From Csisztapuszta we can return to the shore of Balaton, to Balatonfenyves, by a romantic narrow-gauge railway, too. Hiking and cycling tours to the most beautiful places of Balaton on request or on preliminary registration.